At the Marvin Experience Center at 7 Tide, six 3-D models of actual homes are prominently displayed. 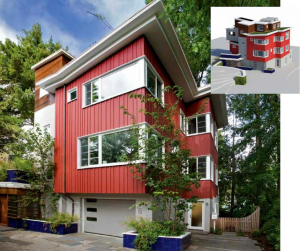 They were selected from submissions to the Marvin Windows-sponsored annual Architects Challenge. We asked each of the architects represented to discuss their design approach, what inspires them and what it means to be included in the Marvin Experience Center. Much of my inspiration comes from client feedback. Sometimes a client will have a vision, but they’re not able to put it on paper, so I take the words and descriptions and bring that vision to life. We were looking at rigid lines on this house, with a Gambrel shape. I wanted to soften up the exterior, so I installed circular and arched windows to break up the hard lines. The property is on the ocean, and I wanted to reflect the environment. There are many different things you can do with windows. There are different grill patterns and ways to operate the window that create a different aesthetic. We used a heavier grill pattern to give the house more of a coastal New England feeling that we felt was appropriate for the location. It’s a unique honor to be selected for this gallery. We take a lot of pride in our work, so it’s pretty cool to see it on display. Having our name on a project like this has definitely given us recognition and has been a huge help to our business. The house is sited on Lake Champlain, so we were going for big views out to the lake and north up to Burlington. That led us to choosing a combination of awning and casement windows. We were looking for the largest glass we could find within the budget and for windows that did not require maintenance and could withstand Vermont’s changing seasons. Compositionally, we grouped the windows at corners to gain as many views as possible. With most of our projects, we attempt to connect to the outside by integrating into the landscape as much as possible. Therefore, the choice of window is critical both in terms of visibility and the thermal relationship to the interior and exterior. Our clients are generally looking for us to provide them with something unique and artistic. They’re not concerned about the window itself, but about the overall effect it will create. There is a strong connection between the performance of the window and the composition as to how it relates to the overall architectural aesthetic. Being part of the Marvin tradition and family is important. I like the idea that it’s a family-run business. I feel honored to be selected for this showroom. 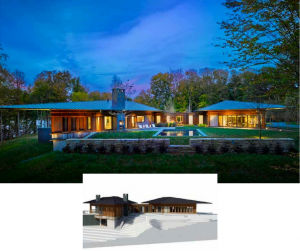 My starting points for a project might be related to a feature or quality of the site, a characteristic of the homeowner, an unusual element or a client’s specific request. Ideally, all of these factors interact to generate the initial inspiration. For the project that we called the “Sustainable Urban Villa,” we selected a combination of fixed and operable windows, choosing them for function, based on the views and the sunlight, and for the look. That gave us the opportunity for a customized pattern of muntin bars that sub-divide the windows into stacks of horizontal lights and panes. Marvin’s Ultimate Sliders afford the greatest sense of opening without intruding into or out of the room the way a casement window would. We also used awning windows at the stairs and in a bathroom for ventilation. When you’re connecting the inside to the outside, the types of dividers in the windows, especially the mullions and frame sash that separate each window, is important. For example, the horizontal sash bar in a double-hung window often ends up at eye level, obstructing your view to the outside. It’s gratifying to have this house selected for display because it is a very individualized residence that was designed to specific conditions and to the goals and personalities of the homeowners. The fact that no one was thinking of such recognition makes it all the more special. I am inspired by architecture and my life experiences. Architects tend to notice specific things like ceiling heights, materials, textures, colors, the way the sun comes through a window. When I meet with clients, I listen to their lifestyle and what they want, and I associate what I’m hearing with my own life experiences. 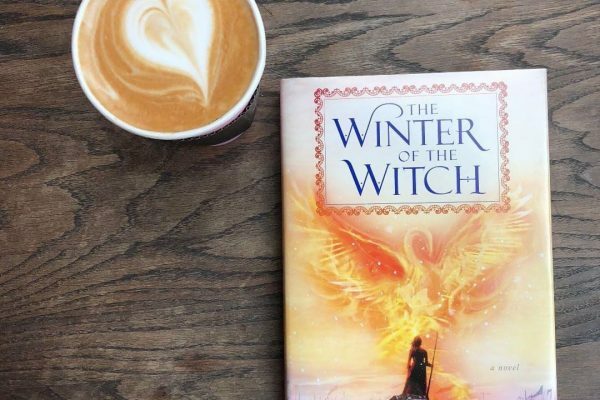 If I don’t have a certain expectation for a project, I go looking for it in magazines, television—all the imagery that we’re exposed to. But all of that flows through the filter of my experience. Some clients are very strong-willed and have a good idea of what they want. I like to be able to say to a client, ‘How about trying this, because I think it meets what you’re saying.’ It’s their house, so I’m going to do what they want, but they’re paying me to find the best solutions. 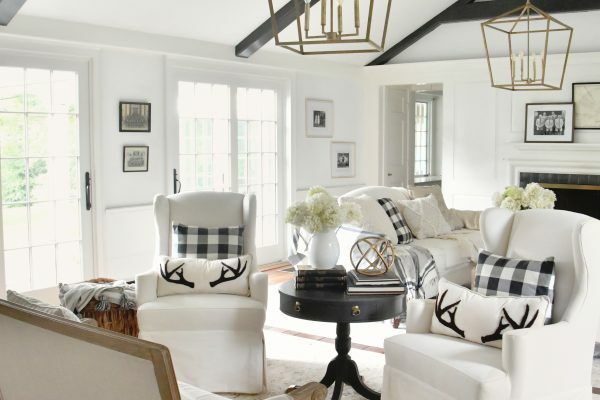 This lake house is the homeowner’s retreat, so they wanted something comfortable and casual. 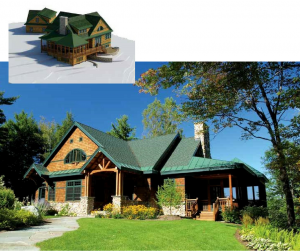 To me, a lake house is all about comfort, with the stone, the wood, the shingles, the heavy timber, the fireplace. With the double-hung windows we did grill work on the upper sashes to allow more depth and detail. I like designing custom-shaped or custom grills, and Marvin does that without any problem. I like to gang windows together, so you have two singles and a triple as the centerpiece to provide balance. It’s humbling to be chosen for this gallery. Only six architects across New England were selected, so I’m very lucky. It tells me I’m going in the right direction. Richard Manzo, Robert Knight; Knight Associates Architects, Inc. 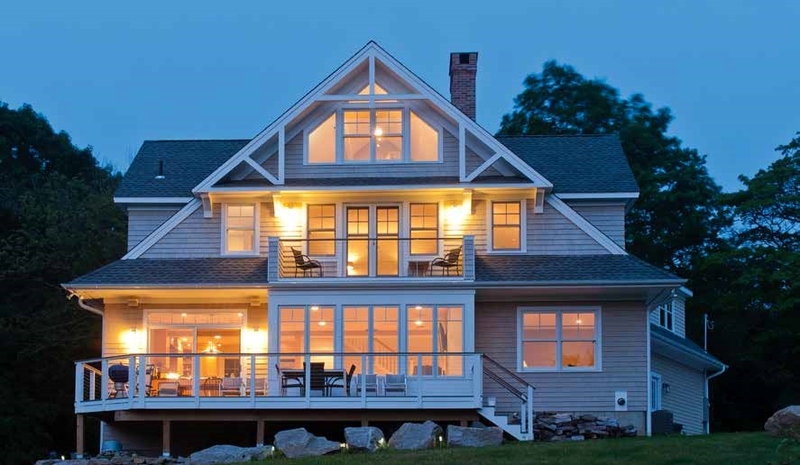 The home is overlooking Barters Island and Sheepscot Bay, so in order to take advantage of the views we added a gabled end on the water side that gave us the opportunity to place lots of windows. 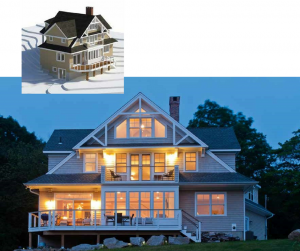 We wanted it to look like a coastal farmhouse, so that influenced our choice of window styles. We wanted light coming in from everywhere. It’s a very simply designed house that looks like it has always been there. We used mostly casement windows, which were factory painted and energy efficient. There are approximately 70 windows in the house, so it was important to use quality windows that would meet the energy codes. That’s why we choose Marvin. Clients usually come to us with ideas and we send them back to come up with a list of things they think they really need. We then look at the site and help them determine what is best for the surroundings. We try to blend in rather than make a statement. We try to respond to the surroundings to make homes look timeless. We didn’t get too exotic with this house. It’s a Shaker-style farmhouse with a cottage feel. We had very talented people who took our design concepts and brought them to life. For this home to be selected is really a success story for lots of people. The house is on the shoreline, not directly waterfront, but up a hill with a view over a cove, so designing it was all about the view. The entire house is lined up for great views of the water. 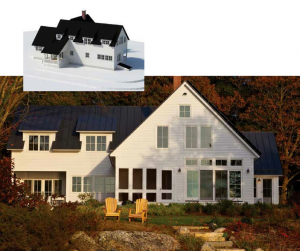 For a traditional Shingle Style home like this, we used mostly double-hung windows, except for in the bedrooms, where building codes make it difficult to do that because you have to meet the code for egress. So we went with some Marvin casement windows that have wide muntin bars to make them look like double-hung windows. We needed to do that in at least one bedroom for egress. There are also casements in the living room that open 100 percent to provide great views and quite a bit of fresh air. To some extent an architect is like an actor in that we play a different person every time we take on a role. I have to take on the personality of my client. I draw lots of inspiration from the site, but much of it also comes from the client. The style of the house and the site has a lot to do with choosing window styles. 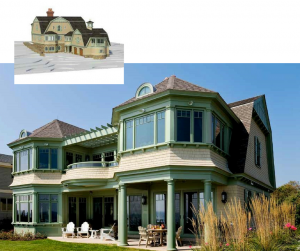 Double-hung windows seem too traditional in a modern house, while casement windows can look wrong in a Shingle Style. I’m always trying to weave all the various elements into a cohesive whole. I’ve had a great relationship with Marvin over a period of decades, so it’s nice to receive this recognition. I’m really proud of this house. It’s one of the best projects I’ve done. Interviews by Rob Duca; Top photo courtesy of Robert T. Coolidge.